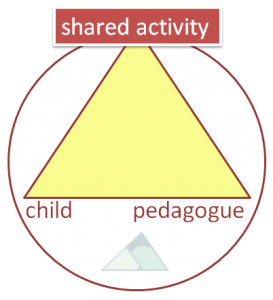 The concept of the Common Third is central to social pedagogical practice. Essentially the Common Third is about using an activity to strengthen the relationship between us and a child and to develop new skills. This could be any activity, be it cooking pancakes, tying shoelaces, fixing a bike, building a kite, playing football together, going on a fishing trip together – the exact activity really isn’t important as long as it has the potential to be more than merely doing something. The Common Third is about creating a commonly shared situation that becomes a symbol of the relationship between us as the professional and the child, something third that brings the two of us together. It allows us to share an activity in a way that we can both be equal, two people connected by something we both enjoy doing. If we undertake the activity with the intention of enhancing our relationship and learning together, it can become a Common Third, but it would be wrong to assume that all activities are automatically Common Thirds (just like blowing into a trumpet does not automatically create a harmonious sound). The Common Third also requires us to be authentic and self-reflective, bringing in our own personality as an important resource. It is about finding an activity in which we and the child are both genuinely interested. In this sense, the Common Third suggests a child-centred approach and full participation of the child in every step – the child has to be involved on equal terms in all project phases, from planning the activity (if it needs planning) to evaluating it afterwards and identifying what we have learned. What makes the Common Third particularly important is that it sees us and the child as learning together. An equal relationship means that we both share a common potential for learning and growth, which makes the opportunities for Common Thirds almost endless: the activities could be not just those that we as the adult might be better in, but also those that the child might be more expert in and can teach us, or even activities that we have both never tried and can thus learn about together. ‘I had been supporting a young boy who was in foster care for around two years. We had developed a good relationship over this time and had done some fun activities together. The plan was for him to return home to his mother, and I was to support him with this transition. Although he was a very energetic, friendly boy who talked easily to adults, he was struggling to open up to people about his thoughts and feelings about returning home. I planned to do a creative project as a Common Third with him to help him think about what he had experienced with his foster carer, what he was looking forward to and also fearful of about returning home and who could help him with this. We discussed this project and planned to build a bridge on top of a board, with all his memories of being with his foster carer on one side of the bridge and his feelings about moving back with his mother on the other side. He liked this idea and asked if we could go to the woods to do it. As this sounded like a great idea, we made plans to do this on my next visit. It was a lovely sunny day, so we took all the art equipment we needed and a rug and found a big old tree to sit under. We laid out the rug on the grass and settled down to work on the project. He decided to use scrunched up tissue paper to make a river to go under the bridge, so we both got busy scrunching and gluing the tissue paper onto the board, and he then put glitter on to make it look like water. He painted the grass on each side of the river and wrote his foster carer’s name on the left side and ‘mum’ on the right, ready to stick his photos, memories and words on. We both experimented with trying different ways to construct a bridge out of twigs and branches that we collected from under the tree. We ended up making it in papier-mâché, which then needed to be left to dry in the sunshine. He said he’d like to try climbing the tree we were sitting under but said he was a bit scared of heights. With a little encouragement from me he tried climbing on the lower branches first to see how he felt and got quite excited. So we ran over to another tree, which had fallen over and had some big, easy-to-climb branches. I climbed this tree too, which he thought was funny. He went on to climb several other trees, getting higher each time. He was thrilled and said he wasn’t scared of heights anymore. At the end of the session when it was time to go back to the car he proudly carried his board with the bridge and river on. He was so proud of himself and said several times “I think we’ve done really well today”; I of course agreed. He was excited to show his foster carer what we had done on our return and put it away safely for us to continue on my next visit. I reminded him and his carer to collect photos and memories to put on the board next time. The example shows that when being guided by the child’s ideas and excitement we can often achieve a much more meaningful, memorable and positive outcome. By emphasising the importance of both us and the child becoming fully absorbed and engaged in the process, the Common Third illustrates that what really matters is how we interact with children – what exactly we are doing together is just the catalyst for developing our relationship, learning together and sharing a sense of happiness.